Are you tired of remembering the number of overs bowled or runs scored? Are you tired of remembering wickets fell? Then here is the app for you. Whether you are playing, refereeing or just watching a Cricket Game at your home or playground, this attractive new look allows you to keep scores in style. Impress your friends and show them the next generation of score keeping. -->This app contains the advanced features compared with primary scoreboard. -->In this app individual scores and extras are included. -->This app also includes timer to estimate the time taken by each team to complete the game. -->You can choose your own theme from the seven different themes present in the settings section and can change the color of the score labels. -->Also can save names of eleven players for each individual team and also can save the names of wicket ticker individually. -->Having the facility to maintain individual 4's and 6's. -->Also have the option to post the score's on your facebook wall. 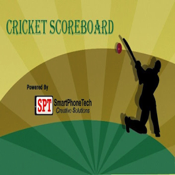 -->In the game result section score, wickets, overs and time taken to complete the game of each team is shown individually. -->In the view results section, the details of total game is shown well.